PNP SCENE OF CRIME OPERATIVE: (LONG, PREGNANT PAUSE) MURDER. Admittedly, it was funnier when we acted it out. We were also heavily into substance abuse at the time. Nevertheless, we were able to make an entire season’s worth of shows where every situation was reduced by our bungling cops, like high school mathematicians, into simplest terms: someone is dead, it was murder. He said that it was “queer” that Mrs. Etong was apologizing in her alleged suicide note (actually given to Failon the night before) because, I guess, when deciding to end your life, apologies and other social gestures are thrown out of the window. Gonzales added that he found it disturbing that the burden of doubt was being placed on Mrs. Etong, who was then fighting for her life. He said that outpourings of support, media coverage of the investigation, and statements from Failon, his daughter and their maids, “in their attempt to enhance Ted Failon’s position” conditioned the minds of people that Mrs. Etong did in fact kill herself. The case is far from closed, but with charges filed against Failon (for not reporting the incident) and his house help (for cleaning up the crime scene,) and an order from the Department of Justice to put him on an airport watchlist, it’s a safe bet that Mr. Gonzales is already downloading some obscure song by The Who and hunting for cool sunglasses for the press conference, negative paraffin tests and tainted crime scene be damned. Oh, you, Raul Gonzales. Never change. Evidence never lies, but in the absence of evidence…well, that’s a whole lot of reading between the lines. Talk about a 180-degree turnaround. WOW. A rare, and judiciously-timed moment of lucidity, that. It’s interesting how government will pussyfoot around the massacre of 56 (and counting) people, but will apply the full force of the law in the suicide of a radio commentator’s wife. There are plenty of “amiss” in the reporting of murder/suicide of Trining. It’s not coming from idiot Philippine highly deep political analysts coumnistas (because their minds are hard-wired to do politics only) but coming from Filipinos abroad that never see print in the idiotic Philippine peryodiko. 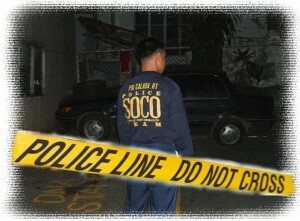 I just wonder why our idiot Philippine peryodistas and columnistas didn’t want to touch Failon murder/suicide/whatever. What is so funny with this event, it turned out the househelps were ARRESTED!!!! DUDE!!!! … and never heard a peep from HIGHLY DEEP POLITICAL ANALYSTS COLUMNISTAS@!!!!!! HA!HA!HA!HA!HA!